While we must keep our pets in mind as we prepare for natural disasters like hurricanes, flooding and tornados, it’s also important to realize the dangers that pets encounter after storms or other emergencies. Although destruction and debris are hazardous, pet owners need to be aware of other dangers like infections and diseases. Such examples are plentiful from Hurricane Harvey in Texas and Hurricane Irma in Florida in 2017. A dog is examined after Texas’ Hurricane Harvey. According to Angela G. Clendenin, Ph.D., M.A., an Instructional Assistant Professor of Epidemiology and Biostatistics in the Public Health Department of Texas A&M University, pets commonly have broken bones and lacerations from flying debris, are susceptible to shock from downed power lines, and can experience dehydration and even malnutrition if lost or left in homes alone during natural disasters. Pet owners should take these into account when first venturing out with pets or letting their pets outside after a hurricane or other natural disaster. But it’s also paramount to realize the danger from contaminated water as an ongoing threat. 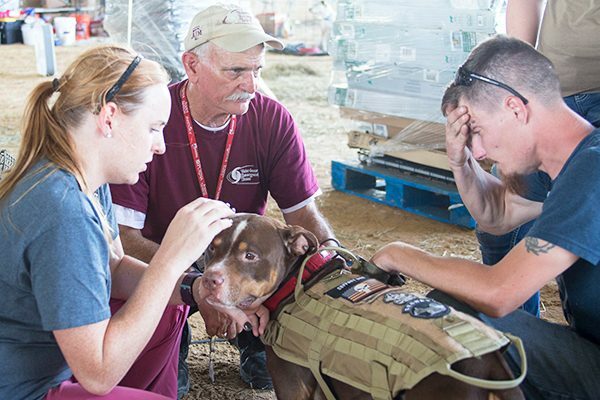 The Texas A&M Vet Fleet helping during Hurricane Harvey. 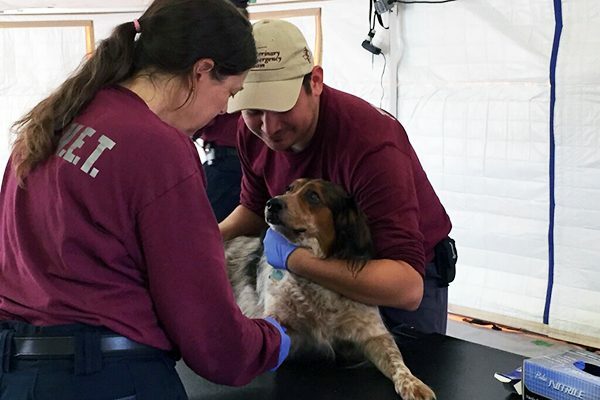 Dr. Clendenin, who spent 21 days with Texas Task Force 1 in Houston and the surrounding counties after Hurricane Harvey, noted that many humans and pets — including search and rescue dogs — were exposed to more than 15 trillion gallons of rain water. The flood waters eventually mixed with septic and sewer waste, garbage, mold, E. coli from wild and feral animals, chemicals, gasoline, home and building debris and “whatever else was under the kitchen sink” to form a stagnant, toxic stew. “Pet owners must understand that if their pets were exposed to these toxic floodwaters, they probably inhaled, consumed or had skin contact with the contaminated water,” Dr. Clendenin says. As a result, many pets acquired GI pathogens. Parasitic infections such as Cryptosporidiosis and Giardia cause diarrhea. Bacterial infections from E. coli and Leptospira (which causes leptospirosis) cause vomiting, fever and more. If a pet shows any symptoms, Dr. Clendenin recommends an immediate veterinarian visit armed with a stool sample for a quicker diagnosis. She suggests extreme vigilance because all of these zoonotic infections can pass directly or indirectly between animals and humans. Dr. Clendenin emphasized decontaminating pets from flood water residue as soon as possible after natural disasters like Hurricanes Harvey or Irma. She suggests using a common product like Dawn dishwashing soap to strip and break down the chemical components from your pets’ fur and skin. Owners must protect themselves as they decontaminate their pets. Cover your eyes and do not get water into your mouth. Afterward, bleach the tub you used to clean your pet, clean your clothes and shower immediately. If owners decontaminate pets outside, dispose of water properly in order to avoid polluting the ground. The local water department can provide tips and techniques. UF VETS volunteers examine a dog brought to a patient care station in Key West after Hurricane Irma. Vector-borne diseases are infections transmitted via bites from infected mosquitoes, ticks, sandflies and others. It is important to know that after Hurricanes Harvey and Irma, the pools of stagnant water are fertile breeding grounds for these flying insects. According to Terminix (a pest control company), the four major Texas cities rank in the top 20 of the “most infested cities in America,” thanks largely to geography. Mild spring and summer temperatures are mosquito-friendly and Southeast winds carry tropical humidity into the state. The moisture, combined with the warmth, makes it easier for mosquitoes to breed. Mosquitoes are problematic too in Florida since, from May through October, the rainy season provides frequent downpours that cause rain puddles and standing water where mosquitos breed. What does that mean for dogs and their owners? If your pet is not receiving regular parasite protection, he or she may be at greater risk for mosquito-borne diseases like West Nile virus and heartworm disease, which may be costly to treat. The best way to avoid illnesses and injuries from natural disasters? Evacuate with your pets! A dog receiving treatment after Hurricane Harvey in Texas. 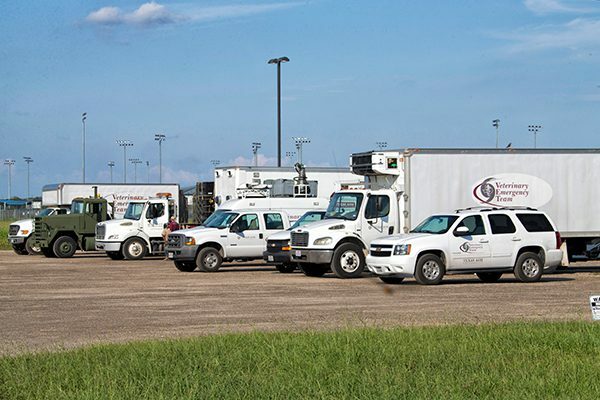 Like Texas A & M University, The Shelter Medicine Program at the University of Florida is integrated into the state’s disaster response system and supports the states 155-plus shelters before and after a storm. 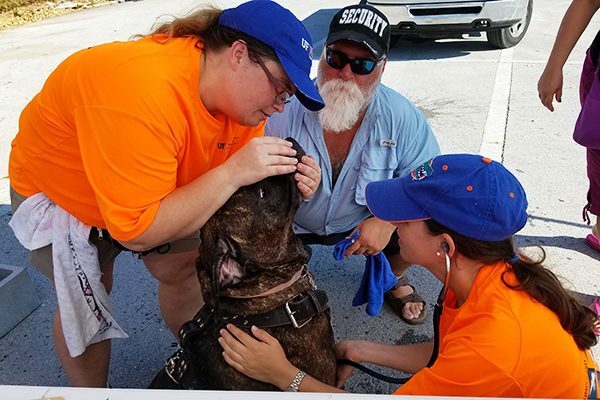 While some of University of Florida team stayed in Gainesville to manage medical needs and the transport and sheltering of pets moving away from Hurricane Irma, others responded to the Florida Division of Emergency Management to assist with animals in the Florida Keys. Lawrence Garcia, MS, DVM, Clinical Associate Professor of Shelter Medicine, who also serves as the Medical Director of the Veterinary Emergency Response Team of University of Florida, traveled with his team first to Marathon and then to Key West with the school’s self-sufficient medical response trailer. According to Michael Fleck, DVM, a veterinarian living along Florida’s Gulf Coast, this recent hurricane season emphasized that it’s critical to prepare accordingly. What happens when you don’t evacuate with your pets? While Dr. Garcia and his team treated pets suffering from lacerations, stress, stomach upsets or diarrhea from eating garbage off the ground or from drinking contaminated ground or tap water, his biggest worry was the pets who were left behind. Since Hurricane Katrina in 2005, Federal Emergency Management Agency (FEMA) has encouraged pet owners to evacuate with their pets. Unfortunately, some Florida Keys residents did not heed this advice. “While we did treat animals found by neighbors, landlords and reserve service, many who went door to door, I expect my team and local vets will see more pets in need of serious medical attention in the days and weeks to come,” he adds. Evacuated with your pets? There are still health concerns when you return. 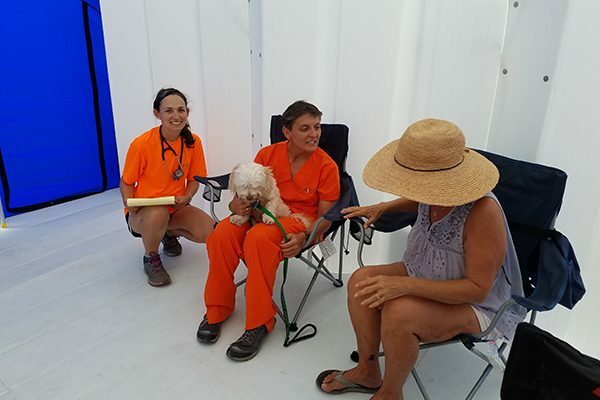 Dr. May-li Cuypers, center, a volunteer with the UF VETS disaster response team, listens to a dog owner explain her dog’s condition during the team’s deployment in Key West. After floodwaters recede and people and pets return to their homes, human and animal respiratory infections are common. Floodwaters and the mold that quickly grows in warm environments like Texas or Florida can exacerbate asthma or trigger allergies, most commonly presented by itchy, watery eyes in humans and itchy skin in pets. The Center for Disease Control (CDC) advises people to avoid direct contact with any items that have come into contact with floodwater. That also applies to pets. Throw away all pet items or clean them with bleach. If possible, wash dog toys in a dishwasher or washing machine on the hot water cycle. Dispose of all dog beds or wash them in hot water with droplets of bleach and dry completely. Carpets should be steam-cleaned prior to pets spending time on them. After a hurricane or any natural disaster, significant pet dangers still lurk inside and outside the home. Pet owners need to prepare, upgrade their disaster kits and rework their disaster plans to accommodate not only their two-legged family members but four-legged loved ones as well. Support animals affected by Hurricane Harvey and Hurricane Irma right here. The post FYI: Pet Dangers After a Hurricane or Any Natural Disaster appeared first on Dogster.